The Tuesday morning commute started off slippery thanks to snow and gusty winds that traveled from Massachusetts up through New Hampshire. The snow forced dozens of school districts to delay or cancel classes. By 8 a.m., the Massachusetts Department of Transportation (MassDOT) reduced the speed limit to 40 mph on the Mass Turnpike from the New York border to Boston. 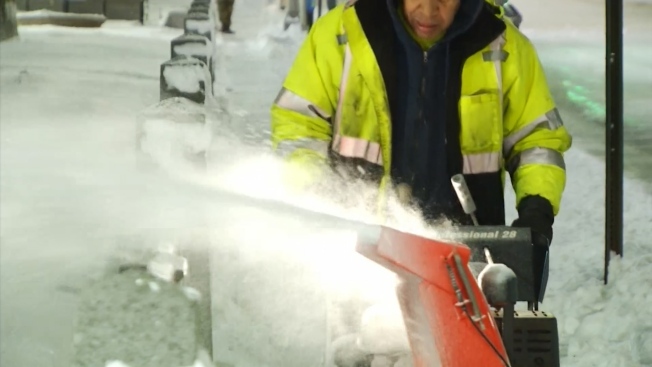 Crews had been out since 6 a.m. with more than 1,300 pieces of snow clearing equipment cleaning and salting roadways. MassDot was reminding motorists to "not crowd the plow." In Boston, MassDOT announced that Morrisey Boulevard between UMass Boston and exit 14 on Interstate 93 northbound will likely be closed due to the upcoming high tide. Detours will be set in place for the closure, which will likely last two hours. The slippery conditions caused crashes in both Massachusetts and New Hampshire. There was an overturned vehicle reported on Interstate 195 in Fairhaven, near exit 18, and other crashes reported in Sharon and Needham. In New Hampshire, crashes were reported on I-93 in Windham and the Spaulding Turnpike southbound. It's unclear if injuries were reported in any of the crashes.